It has been understood for some time that TfL had decided to move staff into modern office accommodation, including removal from the former London Transport home known as 55 Broadway. This intention has now been openly admitted in the press, so presumably plans to get out of this Grade 1 listed building are moving forward. But what, exactly, do we mean by 55 Broadway? Time to shed light, and perhaps correct a few misapprehensions about the site that have been causing muddle. The Metropolitan District Railway (which I shall just call the ‘District’) was conceived in 1863 and opened in 1868 and the company’s offices were at 6 Victoria Street. In fact many railway and consulting engineers had offices in this street or thereabouts as much of their work related to obtaining acts of parliament and dealing with parliamentary agents; proximity to the seat of government was felt essential in days before the telephone had been invented and even telegraph communication was not yet fully developed. As the company enlarged, its offices removed to Parliament Mansions (21-29 Victoria Street) at the end of 1883. Although the offices were convenient, the rent was heavy and the space was restricted. Thoughts turned to having long-term general offices that the company owned. A possible site existed at St James’s Park station. St James’s Park station site (in foreground) in 1868, looking east, towards Tothill Street, from a vantage point somewhere near what was later called Palmer Street. 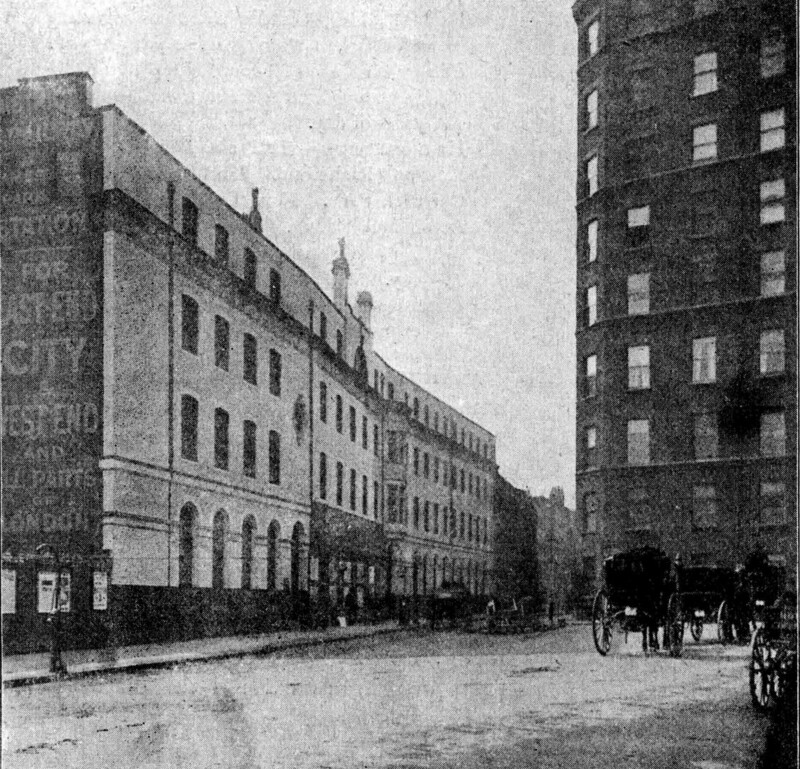 St Ermins Hotel and Caxton Hall would later be built on the right hand side, and Electric Railway House and Albany House on the left. As constructed, St James’s Park station was typical of the era and sat in a cutting about 55½ft wide and about 330ft long, mostly covered by a glazed elliptical iron roof of 22 bays. The only surface building was a ticket hall towards the east end on the north side of the line, fronting York Street (later Petty France) pretty much where the present north entrance to the station is located. The railway here ran in tunnel under Tothill Street and curved slightly south to emerge from tunnel where Broadway diverged from Chapel Street. It ran through the station area and under a bridge carrying Gardeners Lane (now Palmer Street) and going back into tunnel before passing under Buckingham Gate. Between the Broadway tunnel mouth and the station was a short open area, 46 yards long, in which at one time there had also been a siding and coaling stage. In 1897 the District decided to construct offices in the vicinity. Mr. Florence of the firm of Florence and Isaacs, Architects, was commissioned by the directors to prepare plans and estimates for General Offices to be built over the Station; the tender of Messrs Cubitts was accepted and the work was put in hand on 10th January 1898 and completed shortly before the end of the year at a cost of slightly over £20,000 including very considerable alterations to the Station itself (some unconnected improvements had already been made in 1896). The Company moved in on 20th and 21st December 1898 and relinquished its existing offices. The new offices did not prove to be large enough and were extended in 1905 and again in 1909. The new offices were situated along both Broadway and Petty France, with the existing station entrance accommodated within the construction. 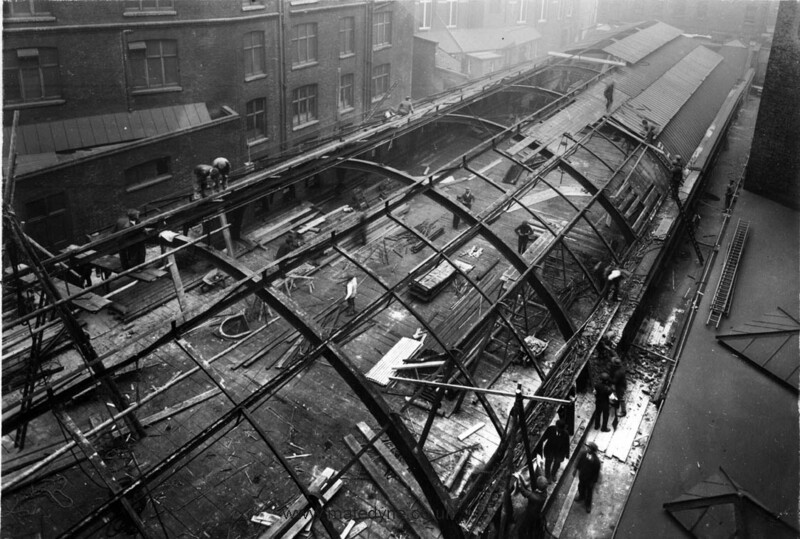 The York Street block extended backwards across the station platforms and altogether these works required the removal of five of the fifteen roof bays at the eastern end; at the same time, the open area at the extreme east end was covered over and developed for shops. View from Broadway looking towards York Street around 1898, District offices on the left. The station entrance is opposite the corner of the right hand block. The exact sequence of development remains to be determined. Photographs show that the buildings were modified by about 1916 with multiple pedimented entrances from both Broadway and York Street. When Charles Yerkes arrived in London and created the Underground Electric Railways Company of London Ltd (and which I will call the ‘Underground Group’) he established offices at the freshly-completed Hamilton House, on the Victoria Embankment, a building that still stands. This briefly served as the offices of the various new tube companies though they soon dispersed to other buildings, such as that above Leicester Square and Elephant & Castle. The newly electrified District remained at St James’s Park, but as the various companies were consolidated the building became the head office of the Underground Group, no doubt precipitating the 1909 enlargement when the whole of the premises became known as Electric Railway House. At about the same time a second station entrance was constructed in Palmer Street, at the west end of the station. The station building spanned the track where previously there had been an open space at the end of the platforms, but it was also necessary to remove two roof bays (which, with the works at the other end of the station, left just eight bays, occupying a surviving length of 176ft). The Palmer Street entrance was opened in 1910. 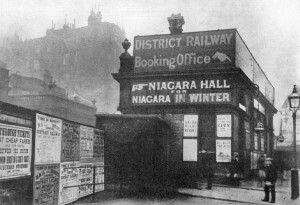 This image is about 1910, after Electric Railway House had been finished and the Broadway booking hall enlarged. This image must have been taken from just inside the entrance. Note straight ahead direct entrance to St Ermin’s Hotel. I think this involved going through the door and a right turn to reach the rear of the hotel. It must have disappeared when the tower block was added. Ticket office on left. Pressure continued to mount when the London General Omnibus Company, Central London and City & South London Railways were taken over in 1912/13. The tipping point was evidently in the early 1920s when it was decided to move the LGOC from their offices in Grosvenor Gardens. This causes a rethink about how best to use the Broadway site and early in 1922 the decision was made to use the airspace above the platforms to construct a new head office building to supplement the existing structures. 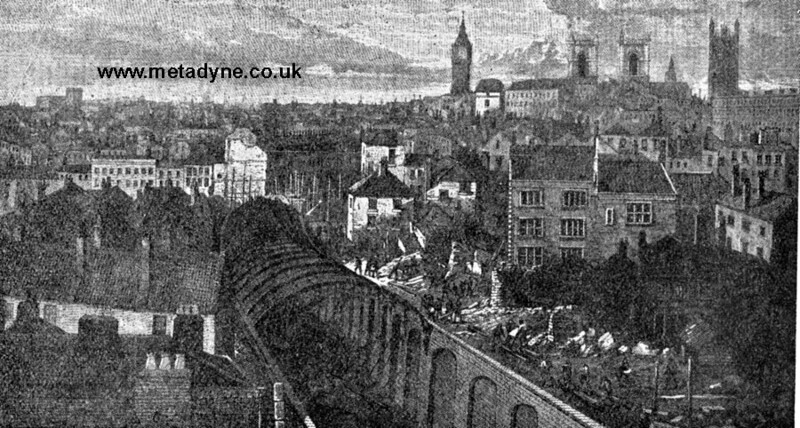 A six-storey building was designed, to be carried on huge iron girders that spanned the tracks; this required removal of the overall roof, which in turn required a protective deck to be installed to protect the trains and passengers below. The ground floor plan of the new block was 200ft by 50ft at ground floor level, but the upper levels were stepped back on the south side to make the best use of the light and to avoid blocking too much light from the back of St Ermin’s Hotel, which ran along the southern boundary. The new building was entirely land-locked and access was gained from the Electric Railway House entrance in Petty France, which was remodelled (and within which the Underground’s war memorial was located). The new building was connected to the old at each level between ground and third floors, and a pair of lifts was provided. The new offices were built on an open-plan basis but intended to be divided into offices by partitions that could be arranged and moved about as necessary. Work began in August 1922 and was almost complete around the end of 1923. 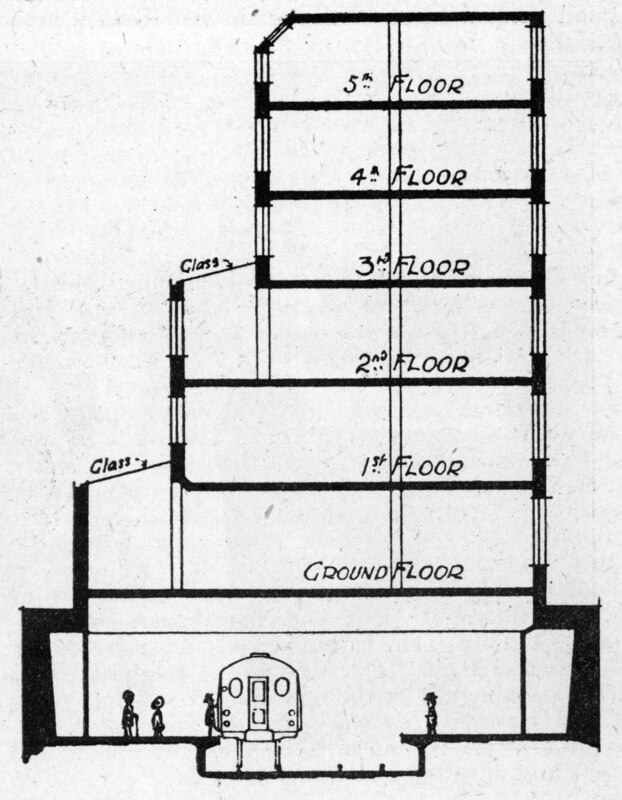 This diagram shows a cross section of the new (1924) building, looking west, station platforms below. The glazed fanlights provide useful additional light into what potentially are exceedingly grim surroundings, the bulk of the St Ermin’s hotel is immediately to the left. It was expected to begin occupying the new building in March 1924, initially redeploying the LGOC bus staff from Grosvenor Road. At this time the staff magazine made it known that a name was sought for the building, with a £5 reward for the successful suggestion. ‘Transport House’ was one of the many names already submitted but felt unsuitable (346 suggestions were eventually submitted). The following month it was announced that the new building would not be named, but would simply be called ‘55 Broadway’. At this point a slight digression is called for. Broadway had long been the name of the broad section of road at the west end of Tothill Street, separating the latter from York Street, which was renamed Petty France in 1920. Broadway was therefore a rather short piece of street, though it was more triangular, as it widened out towards its west end where there was a junction with Queen Anne’s Gate. On the north side of Broadway was a succession of small shops culminating in a pub, on the corner of Queen Anne’s Gate, called the Old Star and Crown (still there though hugely mucked about with; when I worked in the area the ground floor was a pub—the Old Star—but the basement, which was entered by a separate door was called the Crown Vaults). On the south side of the road, the only significant building after 1869 was in fact the station, the first building in the road at its very west end, opposite Queen Anne’s Gate. The station entrance was around the area carrying the number 16 or 17 Broadway or thereabouts. Another street met Broadway at its junction with Tothill Street: this was Great Chapel Street, which ran through to Victoria Street. 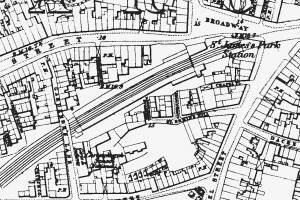 On 1st May 1911 an order was made combining Broadway and Great Chapel Street into a new ‘Broadway’ and allocating the numbers 1-51 (odds) and 6-68 (evens), starting at the Victoria Street end. There was an entrance to Electric Railway House in Broadway following on from No 41, and to its west was the station entrance. These two structures, together, must have occupied the block of numbers 43-51. The choice of the number 55, for a building not directly accessible from Broadway itself is consistent with the numbering, but feels contrived! I suppose it had to have a separate number, but cannot really see this as having been very useful. This view looking west from the roof of Electric Railway House shows the station roof being removed prior to the construction of the 1924 HQ building. The platforms have been decked over, but it may only be a temporary deck. In the background is St Ermin’s hotel (to left) and Caxton Hall (to right). During the later 1920s further expansion of bus and Underground services were expected and the accommodation again appeared likely to become inadequate. It was also desired to centralize administration and reduce the need for older and less efficient premises. The site was looked at again, and it was apparent that it was going to be awkward to add to it. The problem was magnified by a desire to have a building that was designed to impress. The architects (Adams, Holden & Pearson) came up with a cruciform plan that made the best use of the space available at the east end of the site and made the best use of available light. The site was largely cleared in May 1927. The building, begun in 1928, was constructed by The Foundation Company and completed in 1930. When finished it had a floor area of 31,000 sq ft. Above the second floor the building had a central tower and four wings, each 48ft wide. The wings necessarily varied in length, the east wing was 100ft, the west was 76ft and the other two were just 60ft. The top of the tower was 176ft above road level, and was surmounted by a 60ft flagstaff. The original station entrance opposite Queen Anne’s Gate was retained but absorbed into the new structure, the station gaining a modern contemporary ticket hall; above the entrance the bronzework carries the name 55 Broadway in white lettering. From this time, the whole site became, officially, ’55 Broadway’, though the name Electric Railway House inevitably clung on to differentiate the old building. 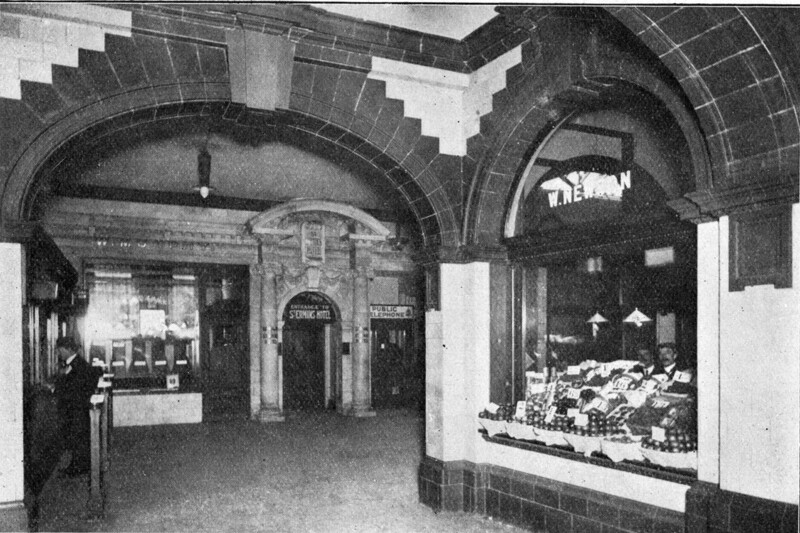 Two new entrances were provided to the east and south, connected to the booking hall via an arcade. 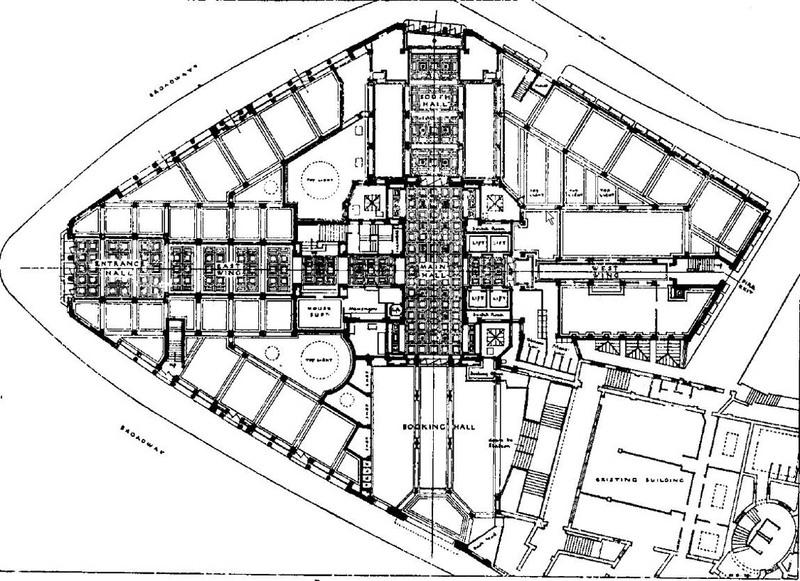 Ground floor plan of the 1929 tower block. The old buildings nuzzle up in the bottom-left corner, though at ground floor there is no physical connection. It can be seen from the plan that the lower floors had to fit around the surviving part of Electric Railway House (the section in Broadway had to be demolished). Although there was no connection between the new building and the older ones at ground floor level, connections were installed at certain of the other floors; these were made from the north wing of the new building. Routes were confusing and tortuous. 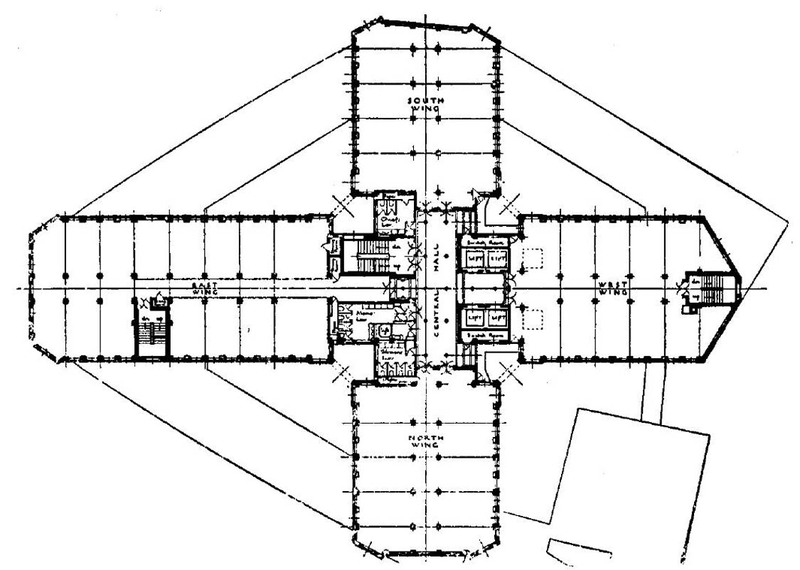 The relatively new block over the platforms became known as Wing Over Station and could only be reached from the new block from certain of the floors that gave access to Electric Railway House, then by finding the elliptical staircase and going up or down half a floor to one of the connections with Wing Over Station. 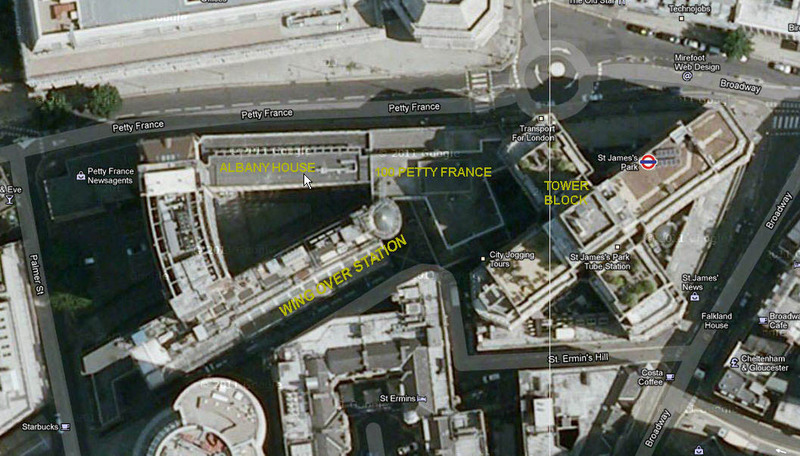 This shows plan view of tower block between second and seventh floors. Electric Railway House soon became very dated but survived until the 1970s when it was demolished and replaced by a modern construction of utterly indifferent character on the same footprint. Disgrace came early. Although the building was only five floors high the bill arrived for a building of seven, and it took a surprising amount of time for this to be noticed. It eventually became a police matter and some naughty people had their collar felt. The extreme east end of the new construction butted up to the 1929 tower block and was finished in portland stone to minimise the impact of the transition; the rest of the frontage has a contemporary appearance (actually I think it looks more like 1950s). There was great reluctance to restore its old name and it was just called 100 Petty France. In 1963 or thereabouts the next block west of Electric Railway House was demolished and replaced by a new construction, called Albany House. As far as I can see it was in multiple tenancy for many years, and it is no surprise that when London Transport accommodation was at bursting point it was used for overflow offices. At some point I have yet to determine (but I think in the 1970s) London Transport took a long lease of the building. The eastern section is of five floors and the entrance hall at the west end is part of a tower of 12 floors (the top one recently built out from a much smaller area). At some point an internal connection was put in to connect with Wing Over Station, immediately behind it. I cannot now recall whether there are one or two connections, but I recall one from the fifth floor of Wing Over station and believe there was another on the second. To get to Albany House from the main Broadway building required a certain amount of planning, and it was usually quicker to use the street. Albany House takes the numbers 86-90 Petty France and is built on the site of Albany Mansions, which seems to have been a mixture of domestic premises and small offices. The entrance to Albany House is graced by a pair of sculptures in bronze by Willi Soukop, son of a Moravian shoemaker. I don’t care for them all that much myself, though they are in keeping with the spirit of the early 1960s and just because the sculptor’s name wasn’t Eric Gill that does not mean they should be ignored (which is what I’m going to do by not mentioning the ornamental flummery attached to the 1930 building!). So much has been said about the 1930 tower that it would be otiose to say yet more here, for that would simply serve to repeat what has been said at length about the tower, usually to the complete exclusion of saying anything about the rest of this large site. Indeed, perhaps rather too much has already been said, largely, I suspect, because Holdenism has rather caught on of late. Less well covered are some of the practical features. Electricity was supplied from the Underground’s own generating station at Lots Road at 11kV and transformed to consumer voltage by transformers in the basement. Water was supplied from a pair of 500ft deep artesian wells below the building and blasted to the surface by compressed air at 120psi where it resided in basement level tanks with a capacity of 42,500 gallons. Further pumps propelled the water, as needed, to a 6000 gallon tank in the tower, from which it was dispensed by gravity. This water originally served for all purposes, but mounting terror of using water from anywhere but a water board main meant the wells were eventually abandoned and capped off. The electric lifts were unremarkable except that as first arranged one pair only served the first three floors and the other pair the upper floors (I haven’t yet grasped how this worked in detail). I suspect this arrangement cannot have lasted long. The building is steel framed and employs 2500 tons of structural steel (the whole building weighs about 35,000 tons). It was an early user in the UK of reinforced concrete on a large scale, greatly speeding up construction and drawing from American practice. For a while the building was the tallest in London, but fire regulations prevented occupancy above the ninth floor, at the 80ft limit then prescribed by the London Building Act. It is often stated that the tenth floor and above could not ‘at first’ be used, as though this was some kind of unexpected misfortune. The reality is that the tenth floor was truly the bottom part of the tower and has quite a small floor area now used as a lecture room (but for a while was a restaurant) and was for some years used as a display area. With limited window space it was not really ever suited for offices. The eleventh floor was a fraction of even this space and housed the lift motor rooms and I think the water tank, and the tiny twelfth was purely for storage (and I think the mechanism for the clock, London Transport’s largest). The lifts only went up to the tenth floor and none of the top floors were ever intended to be offices. This sudden increase in head office accommodation initially meant that the Group had spare space on its hands it and leased out or rented office space to outside companies for some years. These included Dorman, Long (who had nearby offices anyway), Rendell, Palmer & Tritton and the Coal Mines Reorganization Commission. The ninth floor had a large roof area and as war loomed it was felt vulnerable (the building would be particularly conspicuous to enemy airmen). During the 1938 crisis the occupants of that floor were moved out and it was intended to lay 2ft of sand across the entire surface to provide some protection (this suggests at least 250 tons of the stuff would have been needed and would have been a very long job if it had to come up by lift); I cannot confirm whether this was actually done. In any event, on 14th October 1940 a high explosive bomb did land on the ninth floor roof. It hit the west wing without exploding and passed through successive floors until it struck a girder on the fifth floor which caused it to go off. It caused a certain amount of blast damage with an area of floor collapsing onto that below, sending debris into the street, and substantial damage to the external stonework where walls had blown out. A large fire broke out gutting the west wing at that level. After the war repairs were so effective that the damage cannot be detected. A wartime precaution definitely installed was a 6-inch thick concrete layer added to the floor of the twelfth floor. This was evidently only discovered when a new heating system was installed during the 1980s which required the area (described as a burnt out studio) to be converted to a boiler room and tremendous difficulty was encountered installing the pipework. After the war, when inland transport was nationalized, the building became the headquarters of the British Transport Commission, whose staff were located on the ninth floor. They moved out in 1953 and took over the old Railway Executive building at 222 Marylebone Road, and the space freed up was for many years then occupied by the legal staff and company secretariat. The building was first listed as Grade II on 9th January 1970, but it was upgraded to Grade I by English Heritage on 12th January 2011. Listing appears to include the whole freehold, that is to say the tower block, 100 Petty France, Wing Over Station and the Underground ticket hall and platforms. 100 Petty France is peremptorally dismissed as a “Late-C20 extension to NW … not of special interest”. Neither the Wing Over Station (the oldest part) nor the Palmer Street entrance (both part of the listing) are even felt worthy of mention by the guardians of our heritage. The Palmer Street entrance was also rebuilt at about the same time as 100 Petty France, and with equal indifference. I never had an office in the building but was always in and out. Apart from the directors’ wing, it struck me as an untidy place, unsuited to modern needs and extremely noisy when the windows were open in summer. Everything creaked, including the floors, which were particularly noisy. The partitioning was far from sound proof and made it impossible to provide shelves so everything had to be free-standing. Brave attempts had been made to make heating effective, but it was hard to keep up with modern cabling requirements. The best that could be said was that everyone had heard of the place and it was in a nice area with a handy park just a hundred yards away, good shops and restaurants nearby – and it was handy for the Underground! I am not conscious of any planning application having been made for adaptation to the inevitable hotel or luxury flats that see the most likely use for a grade 1 listed building, nor any rumours about who a purchaser might be or what the timetable for moving is likely to be (moving is greatly complicated by various operational control rooms within, including a large British Transport police facility). I am sure that when anything is released it will circulated quickly, and I will try and keep up to date. So, I hope that it will be seen that the history of this block is not without interest and that whenever someone refers to ’55 Broadway’ your mind leaps to the question ‘which bit’? London Underground’s Network Control centre moved from 55 Broadway to Southwark over the weekend of 27/28 April. I understand the timetable for clearing out of 55 Broadway entirely envisages the building being clear by the end of 2013. More anon. Further update – we now know it is to be housing. Excellent history, Mike. I had an office in the main building at 55 Broadway for a time in the early 1990s (second floor, south wing) near the Head Controller's room. It was indeed cold, creaky, and noisy but it was very nice to get out into the park at lunchtimes and shopping in Victoria Street was handy. The whole place was rather shabby and only the 7th Floor and part of the 6th Floor were kept in good condition. Nice one! I like the outfit of the characters. Wish i could do the same thing too but im not that techie.i like the outfit of “from farmer to warden”.. really interesting.